Bekaert, D. V. ; Derenne, S. ; Tissandier, L. ; Marrocchi, Y. ; Charnoz, S. ; Anquetil, C. ; Marty, B., Astr. J.
Bekaert, D. V. ; Derenne, S. ; Tissandier, L. ; Marrocchi, Y. ; Charnoz, S. ; Anquetil, C. ; Marty, B.
Biologically relevant molecules (hereafter biomolecules) have been commonly observed in extraterrestrial samples, but the mechanisms accounting for their synthesis in space are not well understood. While electron-driven production of organic solids from gas mixtures reminiscent of the photosphere of the protosolar nebula (PSN ; i.e., dominated by CO–N2–H2) successfully reproduced key specific features of the chondritic insoluble organic matter (e.g., elementary and isotopic signatures of chondritic noble gases), the molecular diversity of organic materials has never been investigated. 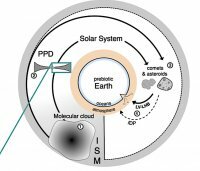 Here, we report that a large range of biomolecules detected in meteorites and comets can be synthesized under conditions typical of the irradiated gas phase of the PSN at temperatures=800 K. Our results suggest that organic materials—including biomolecules—produced within the photosphere would have been widely dispersed in the protoplanetary disk through turbulent diffusion, providing a mechanism for the distribution of organic meteoritic precursors prior to any thermal/photoprocessing and subsequent modification by secondary parent body processes. Using a numerical model of dust transport in a turbulent disk, we propose that organic materials produced in the photosphere of the disk would likely be associated with small dust particles, which are coupled to the motion of gas within the disk and therefore preferentially lofted into the upper layers of the disk where organosynthesis occurs.